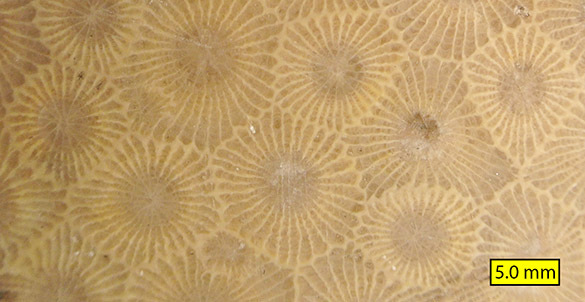 The above pair of fossils are small sclerobionts commonly found on hard substrates in shallow marine sediments through much of the Paleozoic, especially the Silurian and Devonian. Paul Taylor and I have been studying them for a few years now and our first paper on them was published this summer (Wilson and Taylor, 2014). 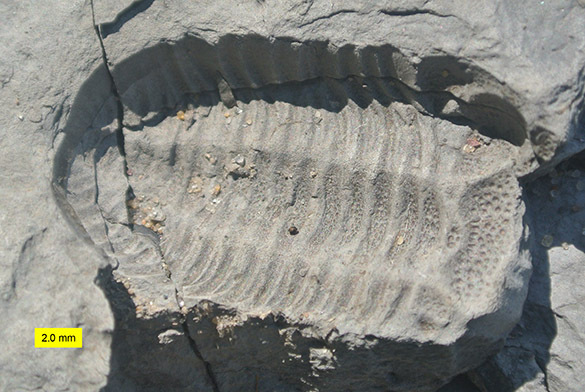 Ascodictyon (Silurian-Carboniferous) is on the left and Allonema (Silurian-Permian) is on the right. Both are calcitic encrusters and look, at least in this view, very different from each other. We present evidence in our paper, though, that strongly suggests Ascodictyon and Allonema are actually manifestations of the same organism. What that organism is, exactly, still eludes us. We are persuaded at the very least that they are not bryozoans as originally described by Nicholson, Ulrich and Bassler. Since they are so common their identity is important for studies of fossil diversity and paleoecology. 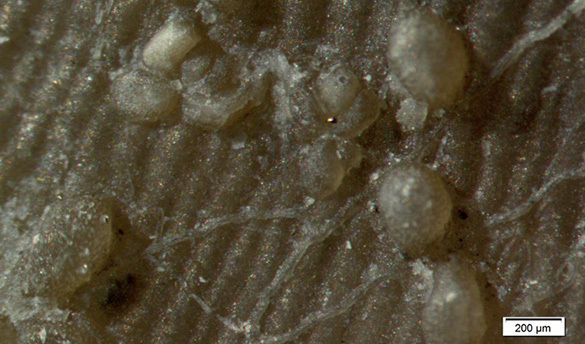 The above view through a light microscope of Ascodictyon and Allonema shows the perspective paleontologists have had of these encrusters until recently. 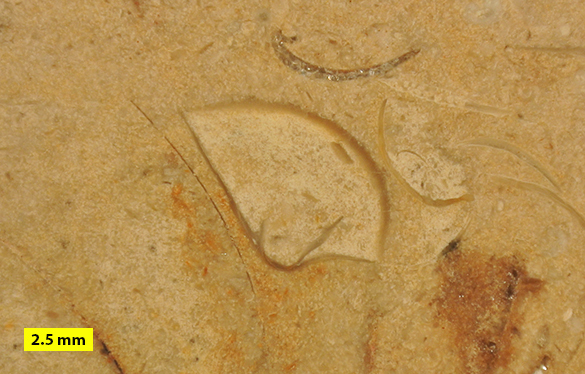 The clear calcite skeletons sitting on a calcitic brachiopod shell (this is from the Devonian of Michigan) makes for little contrast and poor resolution, and the microscope-camera combination has a very limited depth of field. The rest of the images in this post were made with a Scanning Electron Microscope (SEM) expertly operated by Paul. 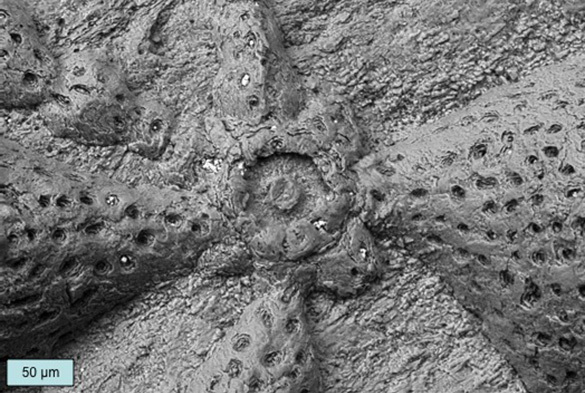 The difference in morphological detail is not just astonishing, it is a revolution in the study of tiny fossils like this. Here is where these obscure little encrusters get interesting. 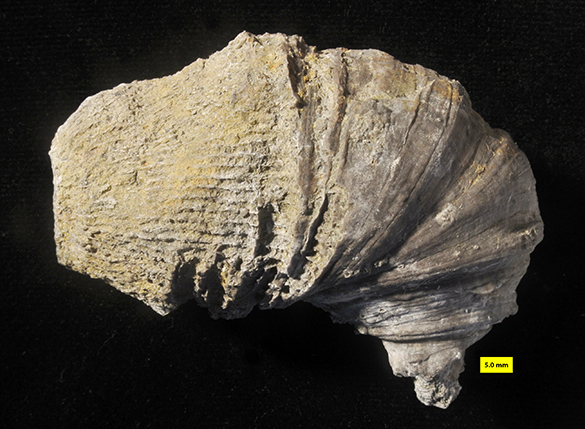 This is a specimen from the Silica Shale (Middle Devonian) exposed in Michigan. It was collected in a beautiful suite of fossils by that intrepid citizen scientist, Brian Bade. 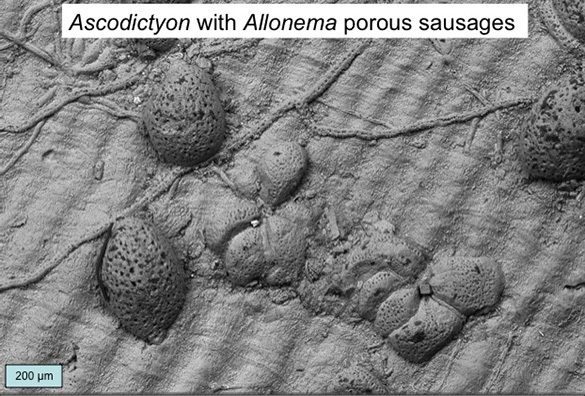 It consists of Allonema sausages connected to Ascodictyon stolons which are themselves connected to Ascodictyon stellate vesicle clusters. Clear evidence that Allonema and Ascodictyon are end members of a morphological continuum produced by the same organism. 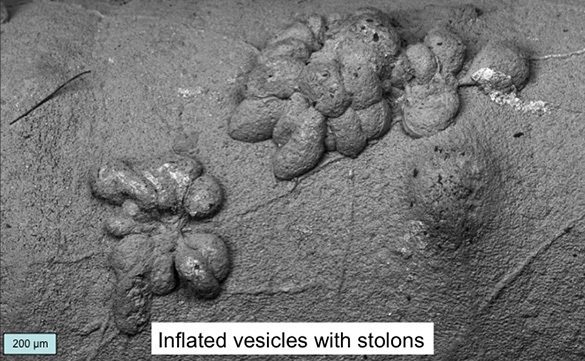 A critical feature we see in this Ascodictyon/Allonema complex is the occurrence of “sockets” at the bases of vesicles like the above from the Silica Shale. These are almost certainly places where some erect portion of the organism extended above the substrate. Maybe these were feeding devices? Reproductive parts? We’ve found no trace of them. 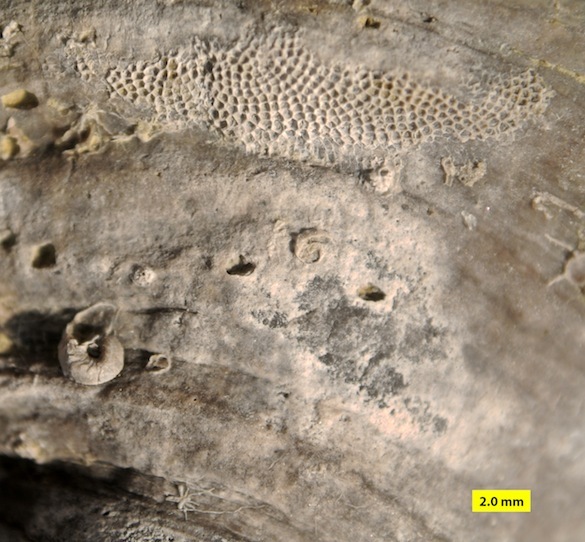 Our hypothesis is that Allonema (left) and Ascodictyon (right, both from the Silurian of Gotland, Sweden) are the basal parts of some as yet unknown erect organism. They may have stored nutrients for the creature. 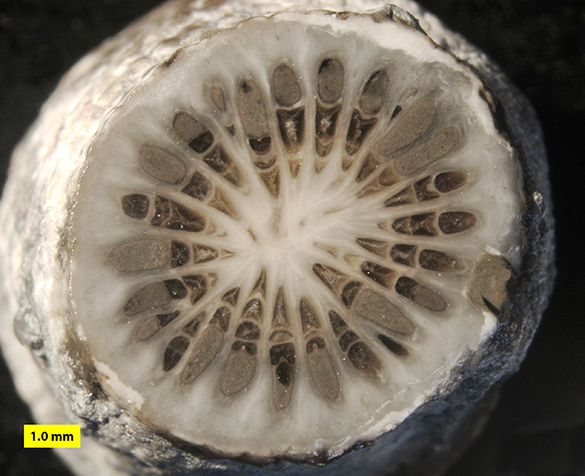 We are convinced they were not bryozoans, foraminiferans, corals or sponges. Unfortunately we can only classify them as incertae sedis or Microproblematica. At some point we’ll have to figure out how to name this complex with two genera and over a dozen species. It was fun work, and the project continues. For more detail, see Wilson and Taylor (2014). 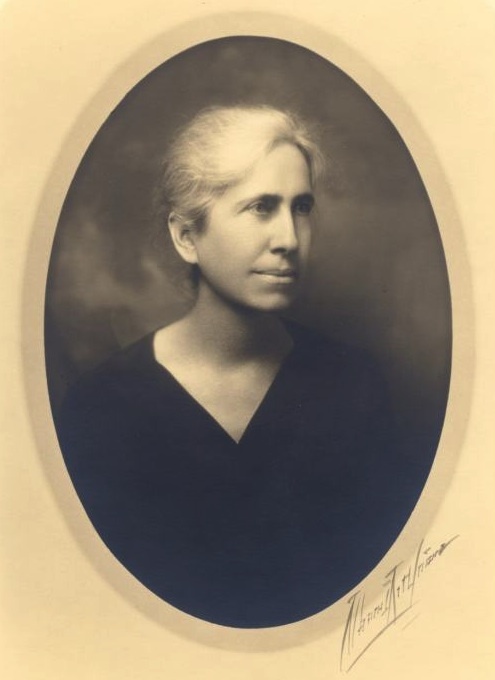 Nicholson H.A. and Etheridge R. 1877. On Ascodictyon, a new provisional and anomalous genus of Palæozoic fossils. J. Nat. Hist., Series 4, 19: 463-468. 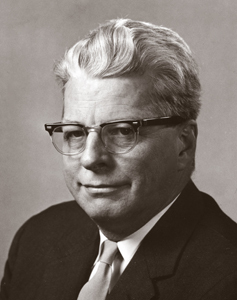 Ulrich E.O. and Bassler R.S. 1904. 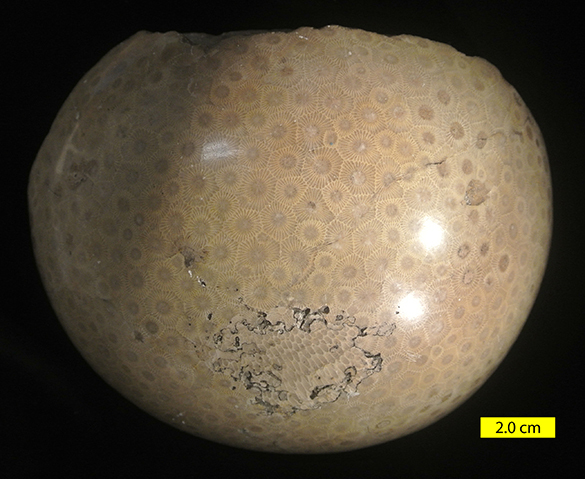 A revision of the Paleozoic Bryozoa. Smith. Misc. Coll. (Quart.) 45: 256-294. Wilson M.A. and Taylor P.D. 2001. 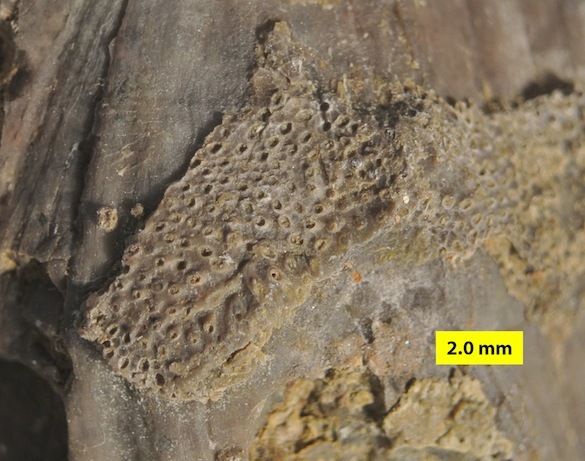 “Pseudobryozoans” and the problem of encruster diversity in the Paleozoic. PaleoBios 21 (Supplement to No. 2): 134-135. Wilson, M.A. and Taylor, P.D. 2014. 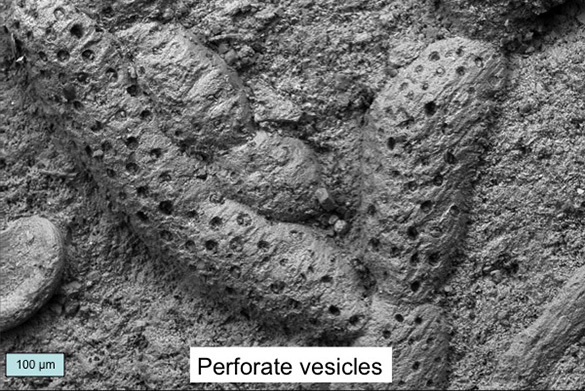 The morphology and affinities of Allonema and Ascodictyon, two abundant Palaeozoic encrusters commonly misattributed to the ctenostome bryozoans. In: Rosso, A., Wyse Jackson, P.N. and Porter, J. (eds. 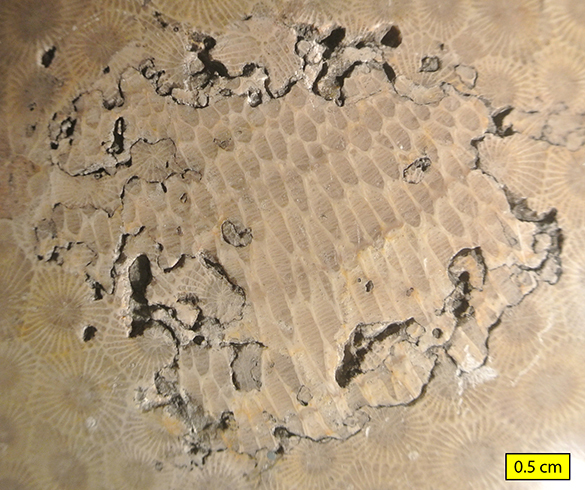 ), Bryozoan Studies 2013. Studi trentini di scienze naturali 94: 259-266. 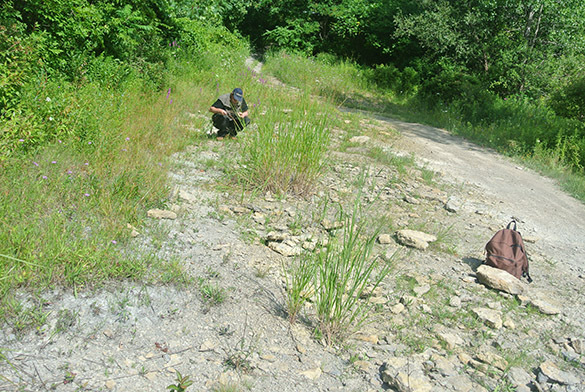 NEW LONDON, OHIO–The Wooster paleontologists spent a pleasant afternoon with our favorite amateur fossil collector Brian Bade. 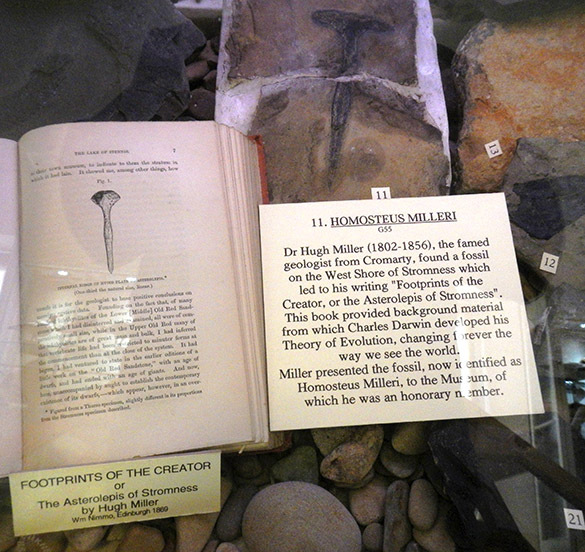 Brian has been mentioned in this blog previously for the many important fossils he has found and donated. He is a spectacular citizen scientist with a deep love (some would say obsession) with fossils of all kinds. He has a tremendous collection of fossils from the region and elsewhere carefully cataloged as to formations and localities. He knows what specimens may have scientific importance, and he has always been most generous with his time and fossils. 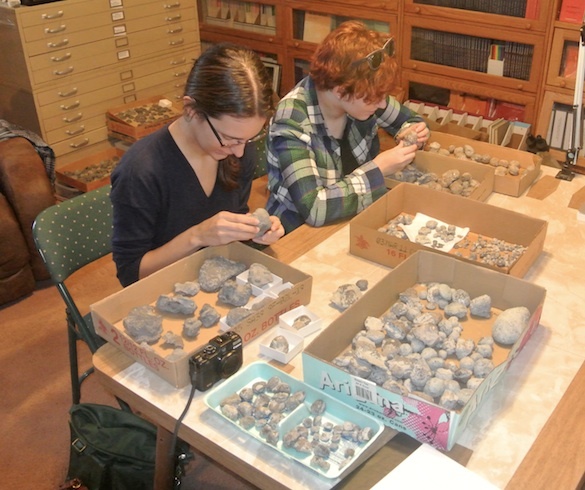 Today Steph Bosch (’14), Lizzie Reinthal (’14) and I visited Brian to examine specimens he recently collected from the Waldron Shale (Silurian) exposed in the St. Paul Stone Quarry in St. Paul, Indiana. My colleagues and I need to examine Silurian microconchids from North America and, sure enough, Brian came to the rescue with his collections and eagle eyes. Not only did he have his cleaned and sorted Waldron material laid out for us, he also had segregated specimens that had encrusting microconchids on them. The fossils were fantastic. 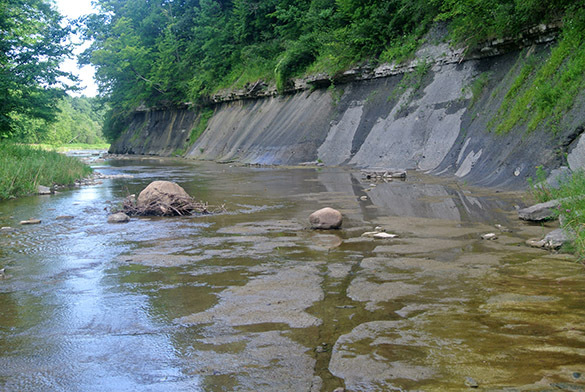 Check out this webpage to get an idea of the paleontological diversity at this site. Brian also brought out other trays and boxes of fossils from the Silurian and Early Devonian that had encrusters. Lizzie and Steph proved adept at picking out the tiny microconchids with their bare, young eyes as I struggled with my usual handlens. (This was the typical situation during our fieldwork in Israel this summer as well.) We accumulated several excellent specimens for later study under a Scanning Electron Microscope. Brian once again came through with critical fossils collected with all the right information for scientific analysis. And the other rescue by Brian? You can see the situation in the image below. 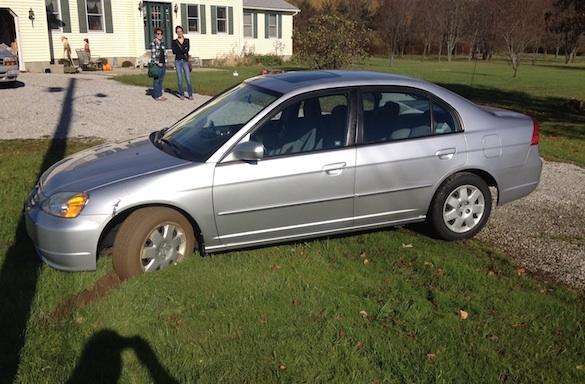 After all the driving I did in exotic places this summer, I managed to burrow into deep mud in Brian’s front yard. My little car was completely mired. (Note the smirking students in the background getting ready to tweet photos.) Brian has a tractor, fortunately enough, and a long chain. I left behind two deep trenches in his grass, and a little bit of my pride. If you’ve been to a rock shop, or even googled “fossil”, you’ve seen these beautiful and ubiquitous objects. 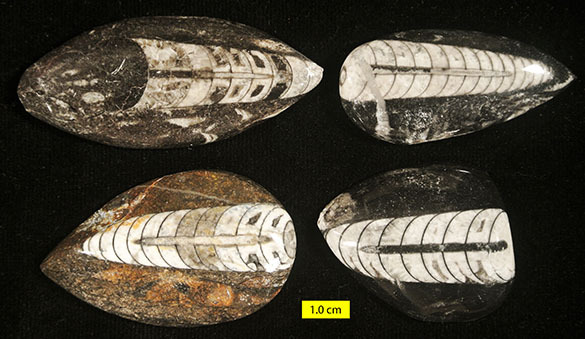 They are polished sections through a nautiloid known as “Orthoceras“. 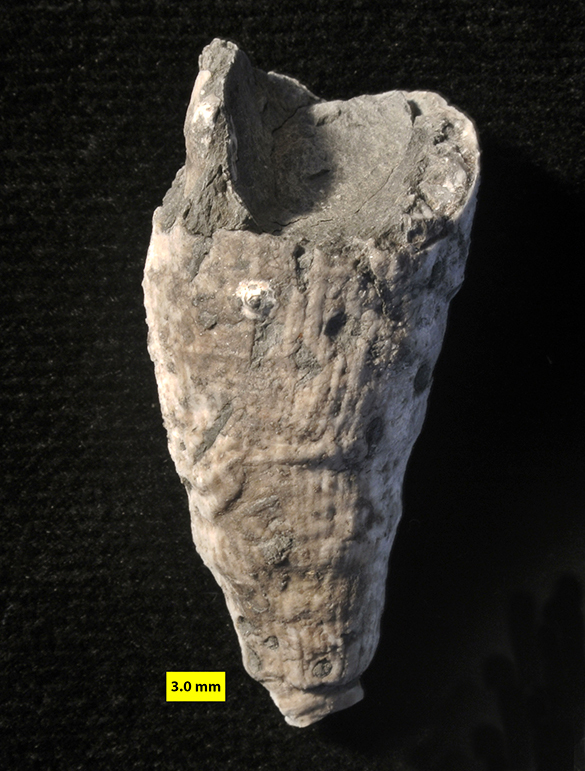 We put quotes around the genus name because with these views it is nearly impossible to identify the actual genus, so “Orthoceras” becomes the go-to term for unknown orthoconic (straight) nautiloids. 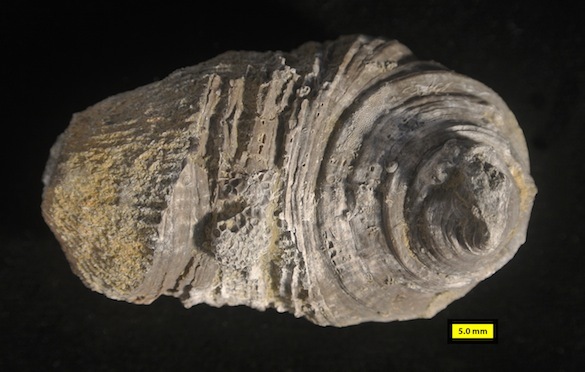 We also do not know exactly where in Morocco these fossils come from, but chances are they were dug out of the Orthoceras Limestone (Siluro-Devonian) exposed near Erfoud in the Ziz Valley near the edge of the Sahara Desert. They are easily excavated, take a nice polish, and look good from almost any angle of cut. People bring these to me often to ask about their origin, so let’s do a Fossil of the Week about the critters. These fossil nautiloids consisted in life of a long, straight conical shell with internal chambers pierced by a long tube. 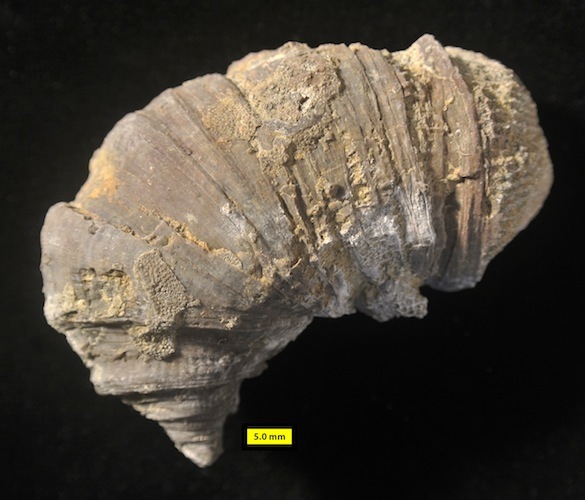 The shells were originally made of aragonite, but almost all have been replaced and recrystallized with calcite. A squid-like animal produced the shell. Most of its body was in the large body chamber at the open end of the cone. They were effective nektic (swimming) predators during the Paleozoic Era around the world. In some places (like Morocco) nautiloids were so common that their dead shells carpeted shallow seafloors. Nautilus is a living descendant. In this closer cross-sectional view of a Moroccan “Orthoceras“, we can identify the critical parts. A = a chamber (or camera); B = the siphuncle (tube running through the center of the shell); C = a septum that divides one chamber from another; D = an orthochoanitic (straight) septal neck of shell that runs briefly along the siphuncle. The white to gray material is crystalline (“sparry”) calcite that filled the empty shell after death and burial. 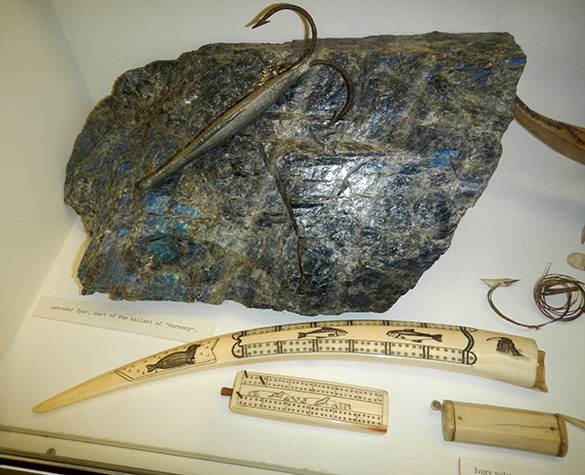 By the way, you can buy “Orthoceras healing stones“. A quote from that site: “Fossils are believed to increase life span, reduce toxins, anxiety, stress, balance the emotions, make one more confident. Containing supernatural and physical healing powers. They promote a sense of pride and success in business. Healers use fossils to enhance telepathy and stimulate the mind. Traditionally, fossils have been used to aid in reducing tiredness, fatigue, digestive disorders, and rheumatism.” No wonder paleontologists are always the very image of health and wealth! 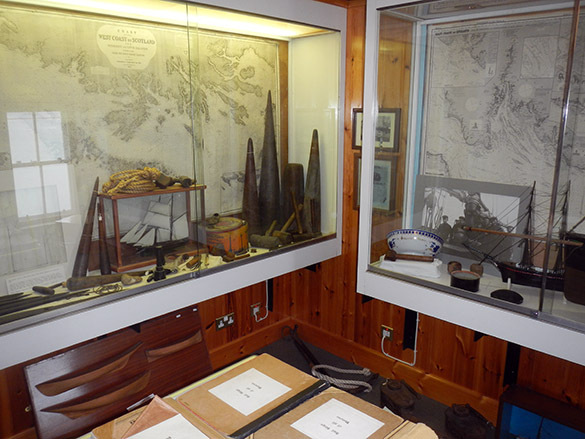 The genus Orthoceras was named in 1789 by the French zoologist (and physician) Jean Guillaume Bruguière (1749–1798). The only image I could find of him is the small one above. 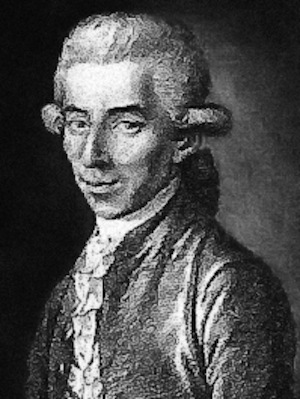 Bruguière earned a medical degree from the University of Montpellier in 1770, but like many aspiring naturalists, he never practiced. He traveled very widely for an 18th Century scientist, usually to pursue living and fossil mollusks on various expeditions. That he was a Republican in revolutionary France probably saved his head, but he lost his income in the turmoil. Most of his descriptions of fossil taxa appeared in print decades after he died on a voyage back from Persia. Of all his taxonomic contributions, the genus Orthoceras is the most widely known. Histon, K. 2012. Paleoenvironmental and temporal significance of variably colored Paleozoic orthoconic nautiloid cephalopod accumulations. Palaeogeography, Palaeoclimatology, Palaeoecology 367–368: 193–208. Kröger B. 2008. 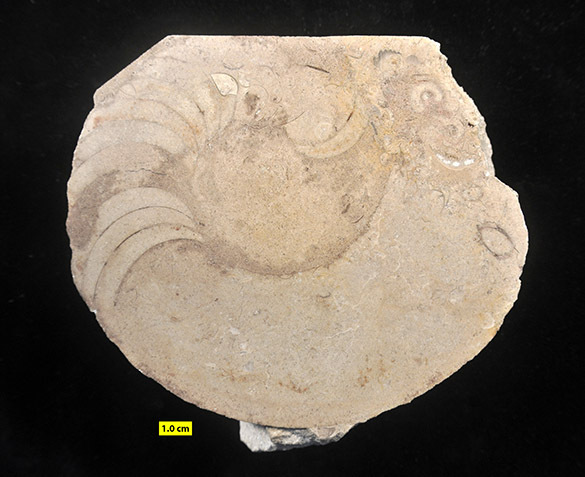 Nautiloids before and during the origin of ammonoids in a Siluro-Devonian section in the Tafilalt, Anti-Atlas, Morocco. Special Papers in Palaeontology 79, 110 pp. Lubeseder, S. 2008. Palaeozoic low-oxygen, high-latitude carbonates: Silurian and Lower Devonian nautiloid and scyphocrinoid limestones of the Anti-Atlas (Morocco). Palaeogeography, Palaeoclimatology, Palaeoecology 264: 195-209.